First team picture since landing on top of Beijing! Venture leaders China 2014 is a start-up business development program initiated and operated by venture lab and supported by several Swiss partners. swissnex China was proud to be the local partner in Shanghai and Beijing. This highly competitive program has been successfully implemented in Boston for more than 10 years and is now making its first entry into the Chinese market this year. 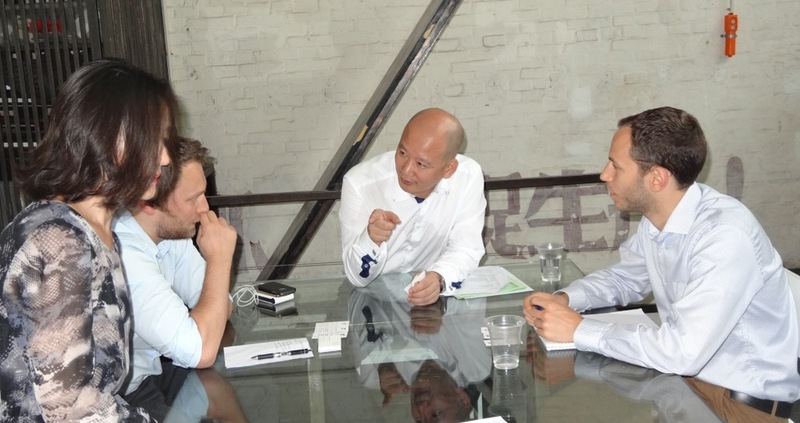 The carefully selected 10 startups or “venture leaders” typically have 3-5 years of successful experience in Switzerland and are now looking to expand their presence to China in the field of ICT, consumer products (fashion & luxury industry) and energy efficiency/clean tech. They embarked on a 10 day “discover-build-execute” mission to Beijing and Shanghai between 3-13 of September 2014, attending lectures of various topics and pitching many times in front of fellow Chinese startups. 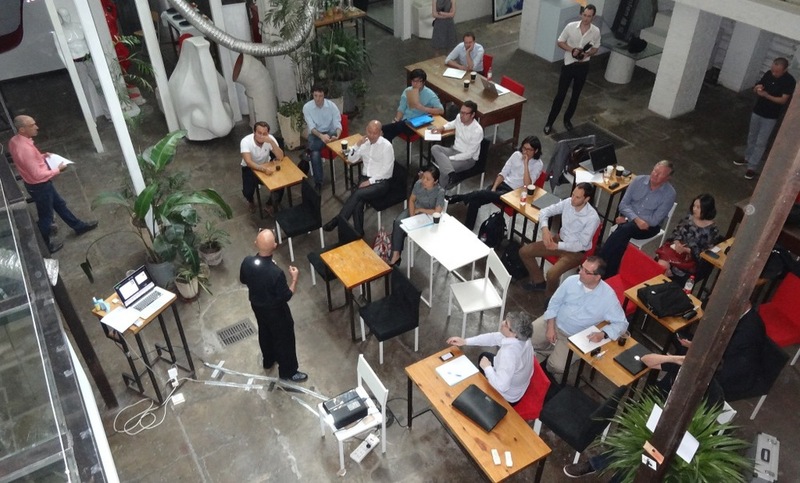 The very intensive program started as soon as the Venture leaders jumped off the plane. At Times Art Museum, a gallery overlooking the CBD area of Beijing, Mr. Alain Graf, Head of the Swiss Business Hub China and Mr. Denis F. Berger briefed on the status-quo of Swiss SMEs in China and the general IP information in China. 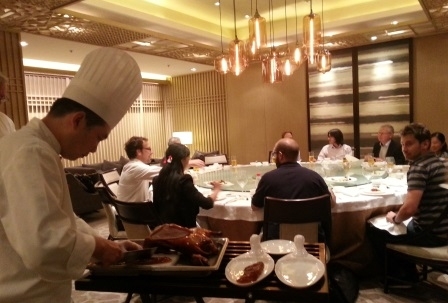 Of course the Beijing experience is NOT complete without a proper treat of the famous Beijing Duck, and that’s how the Venture leaders spent their first evening in China – taking out cameras and filming the Duck-cutting show. On September 4, the venture leaders program started very early but was still caught in a terrible traffic jam, which is also part of the typical Beijing morning experience. But luckily, everybody still made it to Tuspark, the Tsinghua University Science Park. Benefiting from its proximity to the top universities in China, Tuspark has one of the most vibrant and dynamic innovation community in Beijing. The morning session started with welcome and presentation from Mr. LIN Jian, Director of the Tuspark Incubator. The venture leaders were then able to benefit from two exciting presentations by Mr. Cyrill Eltschinger, Strategic Advisor and former CEO of Softtek China who shared his experience of being an expat entrepreneur in China, and Mr. WANG Jianbao, ex-entrepreneur and current researcher at the Institute for Advanced Humanistic Study, Peking University who explained the culture elements in doing business in China. During lunch, the venture leaders got to exchange with fellow Chinese entrepreneurs based in Tuspark. The group then split for individual business development meetings. In the evening, everybody rejoined at Tech Temple, Beijing’s largest shared working space and incubator for an exciting evening of round table discussion. About 100 interested guests from Chinese startup scene came and joined the discussion and networking on topics of common concern – from IPR to identifying partners, from branding to marketing. The Friday program started even earlier than Thursday to avoid the traffic chaos. The venture leaders arrived at ZGC park, the largest and best science park in China. According to statistics, the total revenue of ZGC park accounts for 20% of Beijing’s entire GDP in 2013 (USD 600 billion, very close to Switzerland’s 2013 GDP). The venture leaders were hosted on Inno-Way, a pedestrian with very strong startup spirit and a lot of startup cafe, incubators, startup coaching service providers, angel investors and technology media. The Friday morning session started on time at Binggo cafe, a meeting place for startup entrepreneurs. The deputy director of ZGC park Mr. ZENG Xiaodong was more than happy to greet everybody and welcome everybody to consider ZGC as an entry point to China. Friday morning was all about market entry. 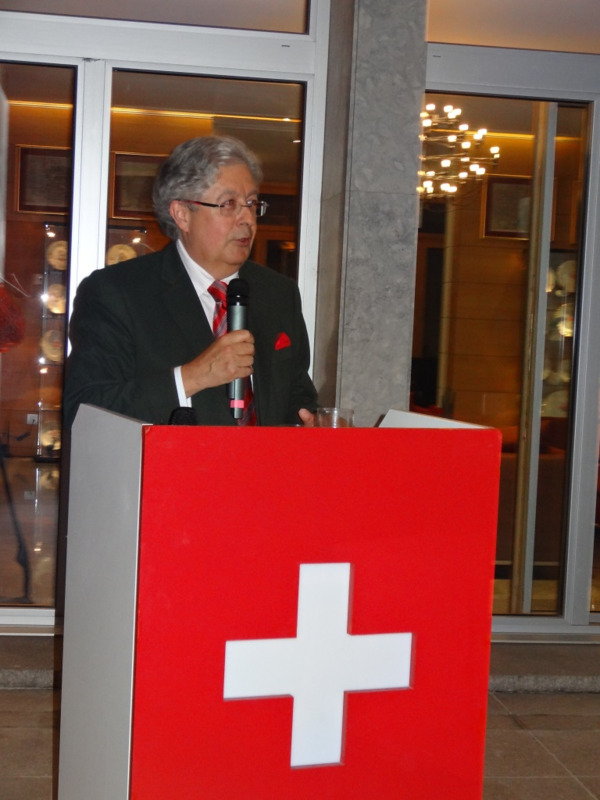 Mr. Nicolas MUSY, founder and CEO of China Integrated shared his 20 years of insight in helping Swiss SMEs enter China. Mr. PAN Guozhang, founder and CEO of Jetbay presented his insight on market opportunities for mobile internet companies in China. The real highlight in Beijing came in the evening at the Ambassador’s Residence, where some 150 VIP guests from the startup scene gathered to meet with the Venture leaders. Quite a number of investors, incubators, science parks, officials, technology media and Swiss MNCs showed up with strong interests in the Swiss innovation and startup landscape. H.E. Jean-Jacques de Dardel, Ambassador of Switzerland to China hosted the event and the venture leaders pitched in front of this incredible crowd of guests. After three very intensive working days, weekends are meant to be fun. Since it is impossible to walk away from Beijing without seeing the Forbidden City and the Great Wall, that’s exactly where the venture leaders were at on September 6th, before flying off to Shanghai for the next crazy week of exploring China.